Want to know what to do when you’re interviewing someone who talks faster than you can write? how to get that great quote that can make your story? how to avoid burdening your story with too much quotation? or even opinions on the best notebook and the right kind of pen? A colleague at the CUNY Graduate School of Journalism, Indrani Sen, has been collecting tips on taking notes. She put them in a handout for her students, and I thought I’d share them with you. The best reporters return from every assignment with a notebook stuffed with quotes, information and sensory detail — the raw material we need to build a story. But how do we fill those notebooks? 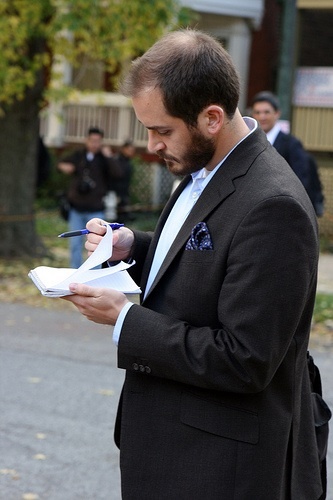 One of the most difficult skills for new reporters to pick up is also one of the most basic — note-taking. Every reporter has his or her own systems for note-taking, which start with some nuts-and-bolts decisions: Reporter’s notebook or steno pad? Ballpoint or roller ball? Shorthand or cursive? To record or not? Try a few combinations and figure out what feels most comfortable for you over a long day of reporting. It’s hard to over-emphasize the importance of solid notes. As well as providing the material for your story, your notes are also your documentation of your reporting process. Your editors or professors may on occasion ask to see your notes. They don’t need to be tidy, but they do need to be complete — if it’s in your story, it should be in your notes or your research. Your notes should also provide avenues to verify information and quotes — phone numbers, email addresses, website urls. Your integrity as a journalist rests not only on your finished product, but also upon your reporting process and your ability to document that process.